“Sentimentality, romance, and elegance as he delivers on this set of standards in a pleasant soothing manner. Bryan Anthony isn’t worried about musical labels. Whether you call him a jazz singer with pop sensibilities or a pop vocalist steeped in jazz, he’s staked his artistic identity in the vast and beloved collection of songs that emanated from Broadway, Hollywood and Tin Pan Alley in the first half of the 20th century. Anthony keeps the legacy of the Great Gentlemen of Song alive and well in his immensely satisfying and sweet nostalgic performances. 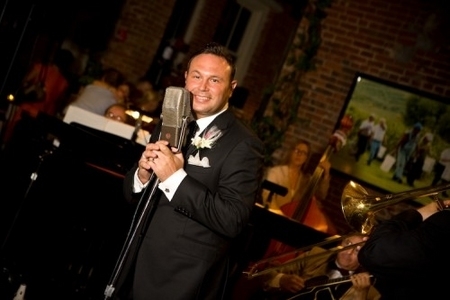 Anthony is a veteran vocalist of the Glenn Miller and Tommy Dorsey Orchestras but it was The Nelson Riddle Orchestra that gave Anthony his best showcase, with its treasure trove of arrangements written for Sinatra, Nat King Cole and Dean Martin. Anthony provides a stunning homage to the Swing Era for contemporary audiences. In his latest album and live show, A Night Like This, Anthony shines as a performer with the personality, technique and panache required to inhabit the music of George and Ira Gershwin, Irving Berlin, Jimmy McHugh, Vernon Duke and the other ingenious tunesmiths responsible for the American Songbook. In A Night Like This Anthony succeeds in his mission to find himself in the music. Whether backed by a brass-laden big band or an intimate piano trio, Anthony knows that, like America itself, the American Songbook thrives when it’s constantly being reinvented.